South Australia’s new Mental Health Commissioner Chris Burns starts today – a role which will see him champion the rights of South Australians living with mental illness. Mr Burns, the former Chief Executive Officer of the Defence Teaming Centre, says he wants to see a more integrated mental health system that better caters for the individual needs of people who use mental health services. “In the coming weeks and months I will be consulting with people living with mental illness, their carers and families, as well as government and non-government service providers throughout metropolitan and regional South Australia,” Mr Burns said. Mr Burns said the new Mental Health Commission is a positive step for South Australia, bringing renewed energy and a new focus to mental health issues. “The Commission will drive reform towards more integrated mental health services and improved outcomes for people living with mental illness,” he said. The Commission will lead the development of South Australia’s Mental Health Strategic Plan which will drive ongoing reform towards more integrated mental health services. It will also monitor mental health outcomes, provide advice across government and bring together the life experiences of clients and professionals in order to achieve reforms in the sector. The Commission will work to strengthen the mental wellbeing of South Australians and promote the wellbeing of people with a lived experience of mental illness as well as that of their families and carers. While developing the Mental Health Strategic Plan, it will focus on a small number of projects where particular issues in mental health have been difficult to resolve. The first project is developing an Action Plan to assist people with a lived experience of Borderline Personality Disorder. Mr Burns said ideas for reform should come from people with lived experience and their families, the community and all sectors including the non-government sector and government housing, education, employment and justice systems. “These are the areas that have a huge impact on the wellbeing of people who experience mental illness,” he said. He said he is pleased South Australia is now represented on a national level. “We’ve seen Commissions in NSW, Queensland, WA and nationally all kicking goals and achieving important change,” he said. 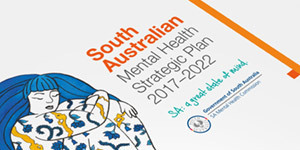 South Australians will soon have the opportunity to have a say on the development of the new Mental Health Strategic Plan through the Commission’s website www.samentalhealthcommission.com.au. The SA Mental Health Commission was established in November 2015 with the appointment of former Chief Public Health Officer Dr Stephen Christley as Interim Commissioner, who undertook significant consultation with the mental health sector.